Meech's Prolific is a popular quince variety, ripening at the end of September or early October in most locations. The fruit should be picked and then stored in a cool place for a few weeks - it is ripe when it turns a golden yellow colour. The fruit has a distinctive fragrant smell and is ideal for culinary purposes, either on its own or mixed with apples. 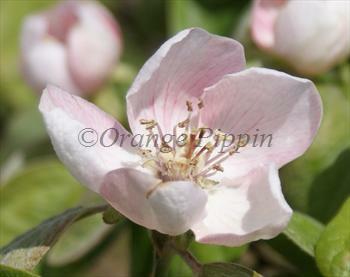 Meech's Prolific also produces attractive spring blossom, and has some ornamental value in the garden. Please fill in the details below and we will let you know when Meech's Prolific quince trees are back in stock. Meech's Prolific is in flowering group 2. Meech's Prolific is self-fertile and does not need a pollination partner, although fruiting may be improved if there is a compatible tree of a different variety nearby. Quinces start fruiting after they are about 3-5 years old, but Meech's Prolific is notably precocious and sometimes starts fruiting after 2-3 years. Meech's Prolific is, as the name suggests, a heavy cropping variety - to get the best flavour and fruit size it helps to thin the crop in May if it looks like there are too many fruitlets. 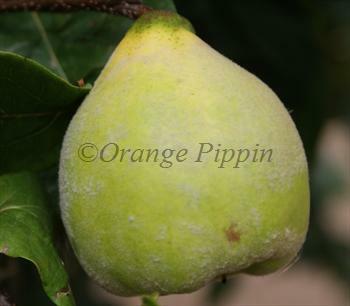 Like most quinces, Meech's Prolific prefers a warm dry aspect but can be grown successfully throughout most of England as long as you take care over its location. Meech's Prolific is self-fertile and no pollination partner is required. It still requires good spring weather for successful pollination, but is one of the better quinces in this respect. Once established it generally requires little or no pruning. Named after a 19th century quince enthusiast, William Witler Meech, from New Jersey, USA. In 1888 Meech published a book called "Quince Culture" which remains one of the most comprehensive resources about growing quince trees. It can be viewed online here, and is also available in print from Amazon. Meech states that this variety originated from Connecticut, and was originally called the Pear-Shaped Orange Quince - but it soon became known as Meech's Prolific.